A.P Govt. released G O No 27 on 28.02.2018 regarding enhancement of Dearness Allowance. 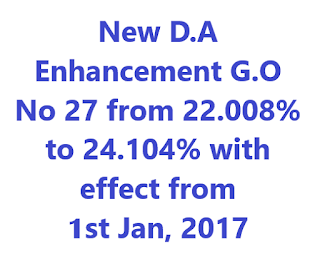 As per this A.P G.O No 27, Government here by order the revision of Dearness Allowance (DA) sanctioned in the Government Orders to the employees of Government of Andhra Pradesh from 22.008% of the basic pay to 24.104% of basic pay from 1st Jan, 2017. All Drawing Officers are requested to ensure that the bills as per the above orders are drawn and the amounts credited to General Provident Fund Account by 30th April, 2018 at the latest. The Audit Officers (Pay & Accounts Officer, Deputy Directors of District Treasuries and Pay & Accounts Officer of Andhra Pradesh Works Accounts Service, etc.) are requested not to admit the pay bills of the Office concerned for the month of May, 2018 unless a certificate is enclosed to the bills to the effect that the arrears of difference in Dearness Allowance for the period from 1st Jan, 2017 to 28th February, 2018 are drawn and credited to the General Provident Fund Account before 30th April, 2018.